My team designed the new and updated mobile dining reservations feature for both the official Walt Disney World® app and the Disneyland® app. As the Lead Designer on the project, I worked closely with my UX counterpart to concept and design the end to end booking experience on mobile. I was personally responsible for both ideating and executing on visual design & UI documentation. Together, we worked directly with product managers and engineers to estimate, workshop, design and launch a simplified and easy to use digital utility for park guests to help book and modify dining plans on the fly, before or during their vacation. As Lead Designer on a small team, I led and art directed every aspect of design for the booking feature from concept to execution, relying on deeply talented interaction and junior designers to own many of the detailed design tasks. My role was primarily leading and facilitating concept and whiteboard sessions with our designers, driving both high level and low level tactical creative vision for the team to work towards, estimations and resource management, managing streams of workflow and process, as well as getting in the weeds to help support our designers. I had the opportunity to present to senior leadership and executives, build strong relationships with business partners, mentor junior designers, drive the myriad visual design tasks and documentation, as well as build and iterate on InVision prototypes for the feature. Our process blurred the lines between disciplines. My design partners and I worked through a ton of interaction and visual concepts to try and solve all of the different aspects of the user journey, from start to finish. Regular jam sessions and check-in’s with engineers, product managers and key partners were essential. We waded through layers of stakeholder review cycles and approvals with patience and poise, sharing ideas with storyboards, prototypes and rapid iteration & refinement. 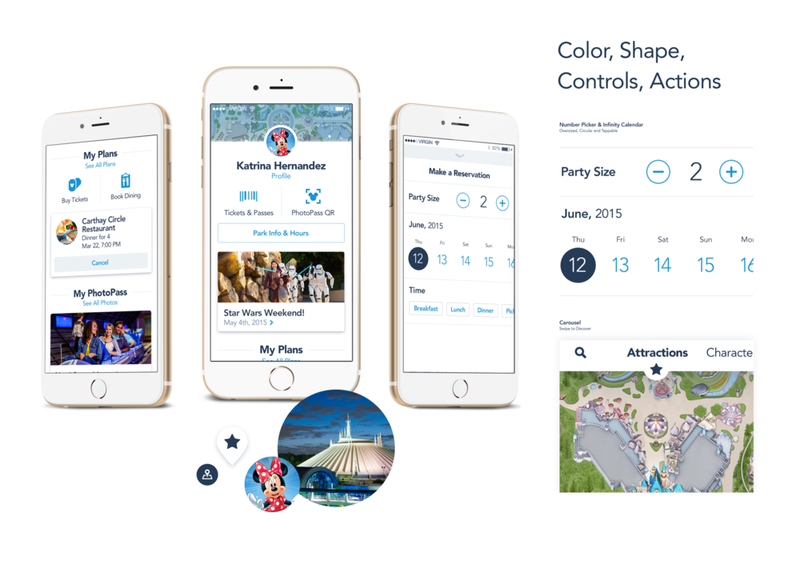 This was one of the first major features in the Walt Disney World® mobile app to utilize the new design language for Disney digital products moving forward, and our first time building an end to end booking and reservation flow into our apps. The design system we implemented was a breath of fresh air, clean and simple, using new interaction and visual design patterns to make bookings simple, easy, and even a little fun.